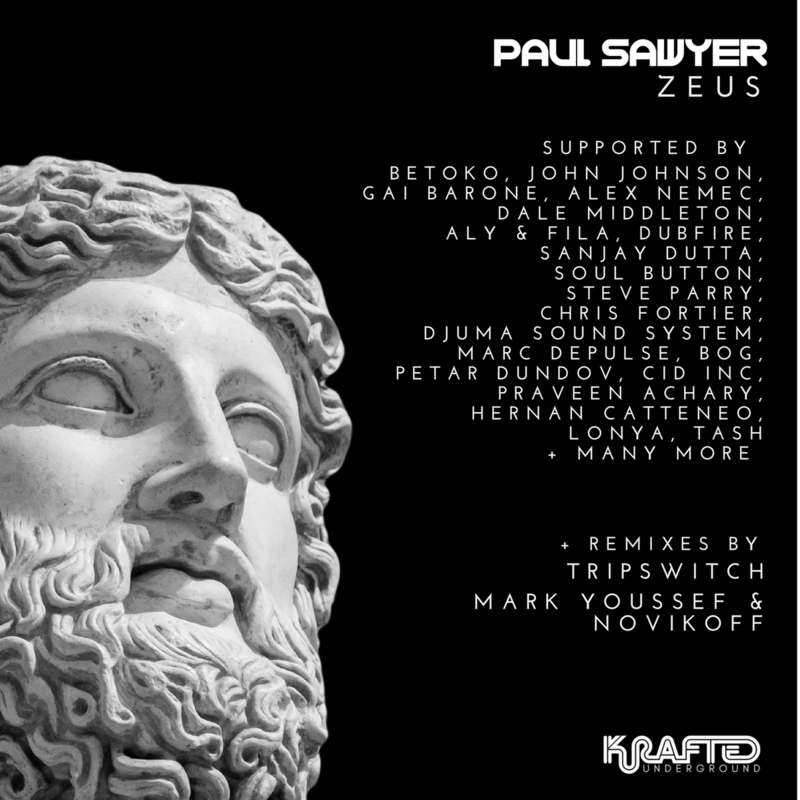 Continuing the stellar Summer set of releases from Paul Sawyer on Krafted, comes his latest EP “Zeus”. Featuring remixes from Progressive stalwarts Tripwitch and Mark Youssef & Novikoff, Zeus has already been included in the DMC Miami Buzz Chart in March and received support from DJs like Hernan Cattaneo, Chris Fortier, Dubfire and more. 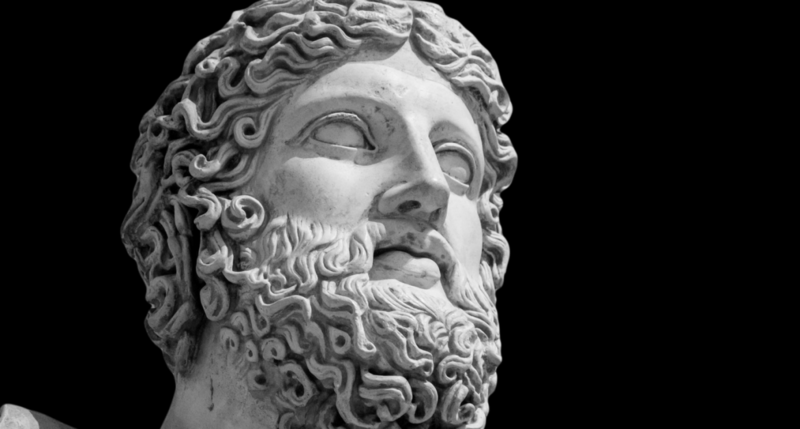 Available for Pre-Order now on Beatport, Zeus is an awesome anthem for your Summer mixes. Hot on the heels of his Nemesis release that featured Nick Muir and Moonface on remix duties, Paul returns to his imprint with another explosive Melodic Techno release named ‘Zeus’. Huge raspy synth lead that fuses the composition together and complimented by two remixes that take the journey onto another path. The musical chameleon that is Tripswitch proves once again why he’s at the top of his game. His remix takes the original synth and smooths out the build to what has resulted in another musical masterpiece. Adding their debut appearance on the Krafted imprint are Mark Youssef & Novikoff. The progressive duo have kept the original vocal and original synth in the breakdown, and have certainly created an infectious groove. What do you appreciate about Tripswitch, Mark Youssef & Novikoff’s work as producers? Why did you think they would be a good fit for this release? Paul Sawyer: I’ve followed Tripswitch for some time, playing his releases in my shows on Frisky and also at events, but what really cemented my view of Nick as a producer was when I got sent his album ‘In At The Deep’ last year. I loved it, you could tell this guy was a real pro in the studio. It resulted in me reviewing the album for DMC World Magazine and looking out for all the releases on his onedotsixtwo label. Mark and Nick’s release ‘Knights’ on Pro B Tech Music did it for me. What a track! I have hammered this track in so many sets and again, on my show on Frisky. It opened my eyes to these two and I have also been listening to Mark’s show ‘Sleek’ for some time. Their music was a really good fit for my sets, so for me, it’s so important to invite remixers that I knew I could play myself. I also look at the profiles of remixers and what they may bring to the release in terms of their popularity, how professional they are with the approach to their own profiles. These guys certainly tick the boxes, all very active in pushing their music and I have the upmost respect for all of them. So having them involved in this release is a real honour and after hearing their remixes, I was so right to ask them, just wow! What is it about this project that made you want to get involved? Mark & Novikoff: We have been working with each other for 3 years now, and for “Zeus” Project – the original was very good when we first heard it, and we wanted to do a remix for it. Tripswitch: Paul’s a bit of a legend on the scene going right back to the early days, so it was a pleasure to be asked to work on one of his tracks. Zeus is a great original, very representative of his style as a producer and I love the challenge of taking a track like that and spinning it off in my own direction. What is your first step when you receive a track to remix? Tripswitch: I always start with a day of setup, sound design and experimentation before I get too heavily into the composition process. So it starts with bringing the original parts into my Logic template and getting them properly organised, colour-coded and giving them my own names that I’ll recognise. It might sound a bit pointless and time consuming, but I really find it helps me to focus, navigate the project and really go with the flow later once the creative juices are flowing. A lot of the time I’ll then pick a few interesting stems and try out various extreme processing / editing on them – these will often then be the creative seeds that will spawn the rest of the track. I have my go-to’s for this, plugins from Eventide, granular synthesis and micro-sampling from Native Instruments and various others. And then the rest of the day is given over to auditioning and designing my own sounds to complement any ideas the original parts are giving me. What is your favorite aspect of building a remix? Mark & Novikoff: First of all we want to thank Paul for the opportunity to make a Remix. We have been watching the development of the Krafted label for a long time, we really like what they do, and when we get such a chance… why not. 🙂 The look at the creation of the Remix was simple, we did not want to do it so that the Remix was fundamentally different from the original, so we created something of our own. Tripswitch: As I said earlier I love the challenge of taking someone’s creation, giving it my own spin and hoping I do it justice! Anyone who makes music will know that it’s an incredibly personal thing, even if it’s not directly emotional music you still put your heart and soul into each track, and I see it as a responsibility to be trusted with someone else’s work like that. But I also enjoy the running start that someone else’s stems can give you, sometimes that’s easier than trying to pull the essence of an original track out of the ether. Would you say that you have a “signature sound”? Mark & Novikoff: Yes! We always work on the sound, each sound is unique for us, in our remixes and tracks we use analog instruments such as Korg, Moog and others… We try to make always high-quality material, and of course like many remixers, we have our own “brand” sounds. Tripswitch: I’d certainly like to think so… I think it’s really important to have a musical identity that people can recognise you by. I guess if my remixes sounded like everybody else there’d be no reason to ask me for one! It’s something people have always said about my music throughout my career as a chillout producer, which makes me very proud. When I started writing progressive house a few years back it was quite a gamble really, it’s a big ask to expect to be able to take that legacy and signature production and turn it into something that works for a different audience and setting, and I was anxious that my prog should still maintain that ’Tripswitch’ flavour. Luckily it seems to have worked, I think in fact the melodic and atmospheric sensibilities that ran through my earlier work translate really well to the prog sound that’s enjoying such a great renaissance at the moment. To you, what are the most important qualities that a great track must have? Mark & Novikoff: We appreciate the quality of the track, all the sounds should be properly combined into one whole track. And also, it is the mastering and balance of instruments. It should be dense in sound… it always helps in large areas. Tripswitch: It’s a very subjective of course, but for me it’s usually always the melodies that turn me on most. You have to tread that fine line between coming up with a hook that’s easy enough for your average clubber to latch on to, but giving it enough of a twist so that you capture the excitement and imagination of the listener as well. There are certain harmonic progressions that have an uncanny ability to create an emotional response – producers like Charlie May and Guy J are geniuses at finding those patterns – it’s those bits of magic that I’m searching for when I write. Having said that, I can equally lose myself in music that’s lighter on melody but with a really solid and hypnotic rhythm section. Some of the South American producers have a real knack with that, Kamilo Sanclemente springs to mind. I think it’s the Latin roots! In a nutshell, a track has to take the listener on a journey, by whatever route comes naturally to you.